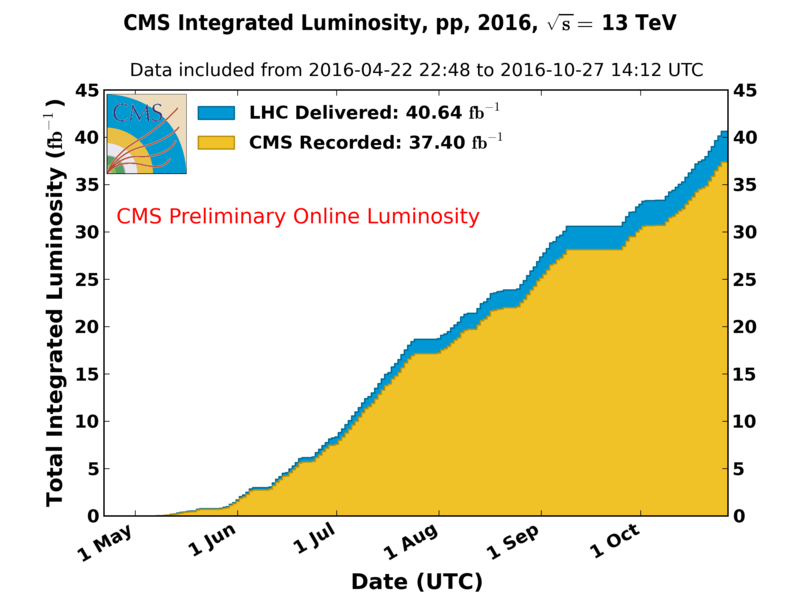 The Large Hadron Collider (LHC) at CERN has already delivered more high energy data than it had in 2015. To put this in numbers, the LHC has produced 4.8 fb-1, compared to 4.2 fb-1 last year, where fb-1 represents one inverse femtobarn, the unit used to evaluate the data sample size. This was achieved in just one and a half month compared to five months of operation last year. With this data at hand, and the projected 20-30 fb-1 until November, both the ATLAS and CMS experiments can now explore new territories and, among other things, cross-check on the intriguing events they reported having found at the end of 2015. If this particular effect is confirmed, it would reveal the presence of a new particle with a mass of 750 GeV, six times the mass of the Higgs boson. Unfortunately, there was not enough data in 2015 to get a clear answer. The LHC had a slow restart last year following two years of major improvements to raise its energy reach. But if the current performance continues, the discovery potential will increase tremendously. All this to say that everyone is keeping their fingers crossed. If any new particle were found, it would open the doors to bright new horizons in particle physics. Unlike the discovery of the Higgs boson in 2012, if the LHC experiments discover a anomaly or a new particle, it would bring a new understanding of the basic constituents of matter and how they interact. The Higgs boson was the last missing piece of the current theoretical model, called the Standard Model. This model can no longer accommodate new particles. However, it has been known for decades that this model is flawed, but so far, theorists have been unable to predict which theory should replace it and experimentalists have failed to find the slightest concrete signs from a broader theory. We need new experimental evidence to move forward. Although the new data is already being reconstructed and calibrated, it will remain “blinded” until a few days prior to August 3, the opening date of the International Conference on High Energy Physics. This means that until then, the region where this new particle could be remains masked to prevent biasing the data reconstruction process. The same selection criteria that were used for last year data will then be applied to the new data. If a similar excess is still observed at 750 GeV in the 2016 data, the presence of a new particle will make no doubt. Even if this particular excess turns out to be just a statistical fluctuation, the bane of physicists’ existence, there will still be enough data to explore a wealth of possibilities. 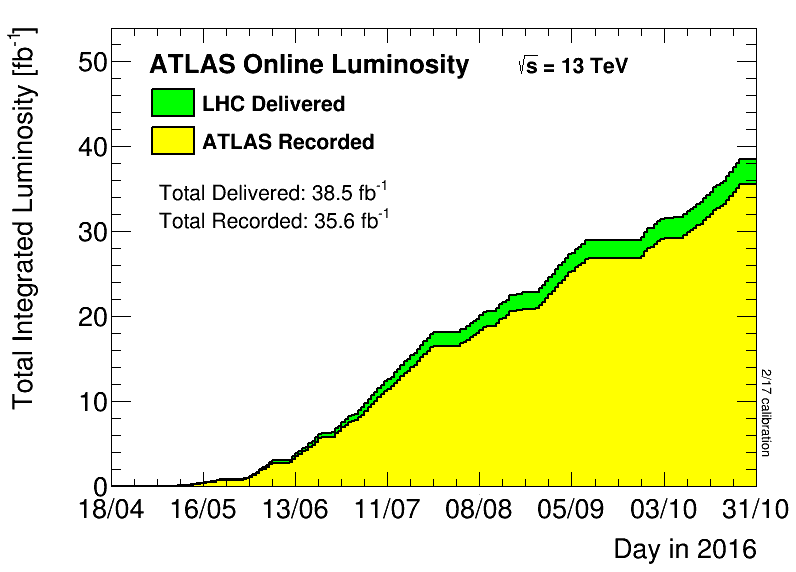 Meanwhile, you can follow the LHC activities live or watch CMS and ATLAS data samples grow. I will not be available to report on the news from the conference in August due to hiking duties, but if anything new is announced, even I expect to hear its echo reverberating in the Alps. To find out more about particle physics, check out my book « Who Cares about Particle Physics: making sense of the Higgs boson, the Large Hadron Collider and CERN », which can already be ordered from Oxford University Press. In bookstores after 21 July. Easy to read: I understood everything! 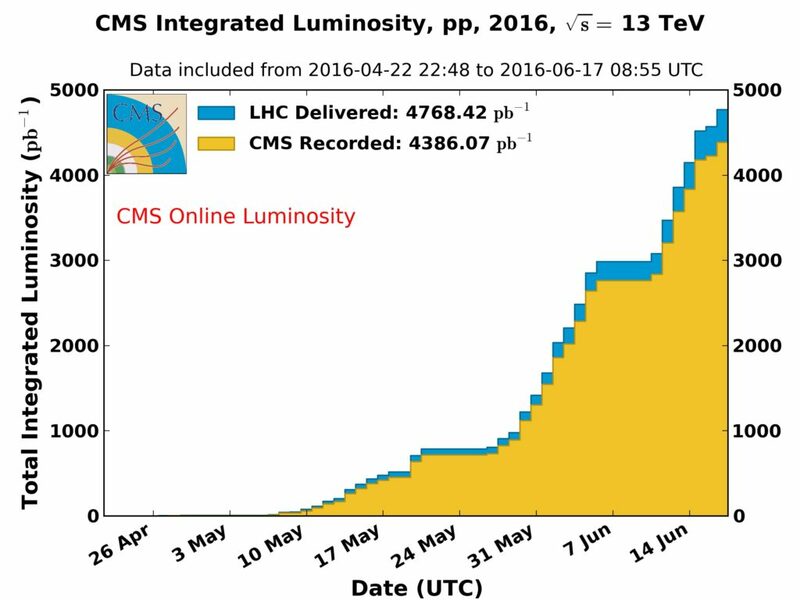 The total amount of data delivered in 2016 at an energy of 13 TeV to the experiments by the LHC (blue graph) and recorded by CMS (yellow graph) as of 17 June. One fb-1 of data is equivalent to 1000 pb-1.